GHOULS & GOURDS FAMILY FALL FESTIVAL @ BROOKLYN BOTANIC GARDEN | STREETS OF NEW YORK 411 INC.
Saturday, October 24, 2015 Noon–5:30 p.m. Kids under 12 are free! . Brooklyn, NY—On Saturday, October 24, Brooklyn Botanic Garden invites the young and young-at-heart to celebrate the Halloween season with Ghouls & Gourds, a family celebration at Brooklyn Botanic Garden. Against the dramatic backdrop of the Garden’s fall foliage on Cherry Esplanade, Ghouls & Gourds is a whimsical and wonderful celebration of autumn and all that comes with it. Wear your craziest costume and come prepared to have a blast! Visitors will be treated to magical sights and sounds, including three different stilt-performing ensembles— Mortal Beasts & Deities, The Brooklyn Jumbies, and The Shinbone Alley Stilt Band! Get up and dance to live musical performances featuring the fierce Brooklyn-Mexican rock of Pistolera, Gato Loco’s brash psychomambo, Baby Soda’s swingin’ retro jazz, Terry Dame’s Science Music Road Show, and more. Fabulous entertainment will be presented in the round at the Hayloft, including the miniature divas of Phydeaux’s Flying Flea Circus of Fate, StreetMule’s groovy Australian didgeridoo; the Mettawee River Theatre’s woodland creatures, and much more. Tweet This! Stilt-dancers, live music, bugs, worms & a costume parade! 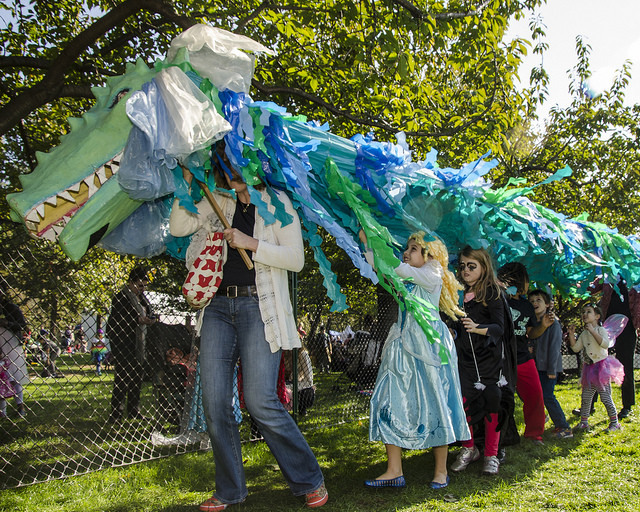 Come to @bklynbotanic on 10/24 for #GhoulsGourds, an autumn family festival. Kids will get up close and personal with a variety of critters both real and imaginary—with an entomologist and her bugs at Dr. Rutledge’s Insectorium, composting demonstrations with adorably icky worms, and, just for toddlers, a pretend petting zoo. Other hands-on activities will include antennae making, a potato pal workshop, and brussels sprout bowling! New this year, in the Discovery Garden kids will have the chance to make and take home their very own all-natural monster repellent! Bookworms can wiggle over to check out the Children’s Book Barn, where there will be readings and book signings by children’s book authors and a pop-up book shop from Community Bookstore. Capping off the day will be a drum circle led by Brazilian percussion band Maracatu NY, and everyone will be invited to join a herd of stilt walkers and giant puppets in Brooklyn’s zaniest costume parade. Stay for lunch! Harvest-time food and drinks to delight all ages will be available for purchase in the Atrium. NOTE TO PRESS: High-resolution images of Ghouls & Gourds at BBG are available at bbg.org/press. To arrange an interview or for further information, please contact communications@bbg.org or 718-623-7241. The full schedule of events can be found below. Tiny acrobats hit the big top. A flock of stilt-walking birds swoop and strut to music by some of the world’s most interesting handcrafted instruments. Woodland creatures invite you to their throwback hootenanny. Come one, come all! Pet a hissing cockroach, feed a hornworm, and meet an entomologist! BAD BUG TATS Get inked with an Asian long-horned beetle tattoo from the USDA’s beetle busters. ARTHROPOD ANTENNAE Craft your very own freaky feelers and become an insect for the day. SQUIRMY WORMIES Enjoy these wiggly worms and behold their compost-creating skills. Try your hand at this crazy cruciferous game of skill. POTATO PEOPLE Create your own little spud pal. POTATO PEOPLE RESORT AND SPA Drop off your new creation for a play date in potato paradise. YOU LOOK RADISHING! Veg out at one of our selfie photo stations. Noon–4:15 CHILDREN’S BOOK BARN Featuring the Community Bookstore Pop-up Shop Get an autograph and enjoy readings from local children’s book illustrators and authors, including Author-illustrator Selina Alko Author-illustrator Sean Qualls Author Lauren Thompson Author-illustrator Melanie Hope Greenberg Author Diane Muldrow Author-illustrator Huy Voun Lee Author-illustrator Nina Crews Author-illustrator Dimitrea Tokunbo Author Kate Hosford Author-illustrator Javaka Steptoe Author-illustrator Deirdre Gill Author-illustrator Jason Chin Author-illustrator Johan Olander Author Robert Kimmel Smith Check out BBG’s books for families: Gardening with Children, The Tree Book for Kids and Their Grown-ups, and The Kid’s Guide to Exploring Nature. 4:30–5:30Costume Parade & Drum Circle Brazilian percussion corps Maracatu NY leads our celebrated costume parade and dy-no-mite drum circle! Join in the fun and carry larger-than-life puppets, make raucous music, shake your bag o’ bones, or just show off your costume for all to see! Ghouls & Gourds activities will take place rain or shine on Cherry Esplanade. Admission is $15 for adults and $10 for students and seniors over 65. Admission for children under 12 and BBG members is always free. General Information Founded in 1910, Brooklyn Botanic Garden (BBG) is an urban botanic garden that connects people to the world of plants, fostering delight and curiosity while inspiring an appreciation and sense of stewardship of the environment. Situated on 52 acres in the heart of Brooklyn, the Garden is home to over 14,000 kinds of plants and hosts more than 800,000 visitors annually. Learn what’s happening at Brooklyn Botanic Garden at bbg.org/visit/calendar, read the Garden’s blog at bbg.org/news, and find out what’s in bloom at bbg.org/bloom. Visitor entrances are at 990 Washington Avenue, 150 Eastern Parkway, and 455 Flatbush Avenue. For hours, directions, and admission information, please visit bbg.org/visit. Follow BBG on Facebook, Twitter, and Instagram, and join the conversation using the hashtag #brooklynbotanic.